None of the links on your website work, at least not with Chrome. First, it opens to a blank page with the menu on the left. Clicking any of the menu choices does nothing. Works fine with IE9. I wonder why Chrome won't display the main content. None of the links on your website work, at least not with Chrome. First, it opens to a blank page with the menu on the left. Clicking any of the menu choices does nothing. Works fine with IE9. I wonder why Chrome won't display the main content. Greetings and thank you for letting me know about the problem. Apparently, as I saw in a Google forum, where Chrome users were complaining about the same problem, v8. * of Chrome has a bug with iframes. This is supposed to have been taken care of in v9. * of Chrome. Other browsers, such as Firefox and IE do not seem to have this problem. If you have not upgraded to v9. * or above yet pleaase do so and let me know if the problem still persists. It was also stated that Chrome's beta version of the no-tracking plugin and/or the Facebook Disconnect plugin was/is blocking iframe content. This problem was seen on Amazon and Facebook, itrself. I am very sorry you were not able to access the content of the Subliminal Visions site. I hope this has proven helpful. Thank you again. I truly appreciate you taking the time to let me know. 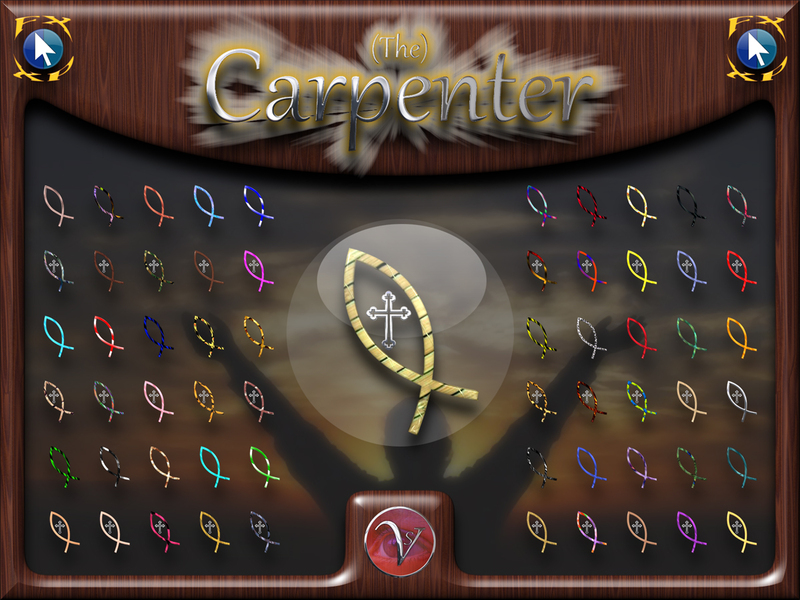 I collected a few really high calibre Christian wallpapers of Jesus-that I will be using this cursor with- thanks ! As for what He has done for me?-- I can never repay Him for all He did and continues to do for me. P.S.-- just want to mention that I also love your Flutterbug cursor too- and am using that one right now with Stardocks' Spring Theme . Thank you for your compliments. It makes me feel good to hear that others enjoy my work and find it useful. I was a little skeptical about uploading a religious-based CursorXP/FX theme. But, the more I thought about it the more I was moved to do so. I see the fish symbol on peoples' vehicles. I figured why not have it moving around on your desktop, as a cursor. Besides, of course, the "big" thing he did for me, He works in my life in big and small ways everyday, such as moving me to create this theme. Thank you so much for creating this beautiful cursor. The cross in the animations is so lovely. I purchased the full pack yesterday and really enjoyed trying out the different colors. Having the 2 sizes is great. I like the way you offer 1 cursor for free so that anyone can enjoy it. This is my favorite cursor now. Great work!!! Thank you for the compliments and thank you again for the purchase. When someone is willing to pay for one of my creations it makes me feel like I realy did a good job. I make at least one cursor from each set free for just the reason you mentioned; so anyone can enjoy my work. I am first, and foremost, an artist, looking for others to enjoy my work. I am truly happy you enjoy the set as much as I enjoyed creating it. I love this cursor. The blessings I receive from God everyday are awesome! Thanks for this cursor! Even went and purchased the entire set! Great work! "Besides, of course, the "big" thing he did for me, He works in my life in big and small ways everyday, such as moving me to create this theme." I have reworked the code. It should work as planned now. Please let me know how it is working on your end. Thank you again for letting me know about this problem. As I do not use Chrome, I may have never known about it. Yet another way He has helped me today. It works correctly now. Thanks! I got fed up with frequent IE9 crashes and switched to Chrome a while back. Chrome has its issues as well, particularly with Flash sites but overall, I'm happeir using it than IE. I Love these cursors, God's Blessings are abundandant. Nice site you have as well. Thank You for this set! You may see some more christian-based themes in the future. I am a firm believer in the "try before you buy" concept. Thank you for your encouragement and your purchase. It honors me to know that others enjoy my work enough to buy it.